We start with U.S. raised USDA Organic Chicken as the #1 ingredient. All organic chicken used in our jerky treats are humanely raised without antibiotics to our exact protocols with organic vegetarian diets. Providing your pets with premium ingredients is our top priority at Tender & True Pet Nutrition. 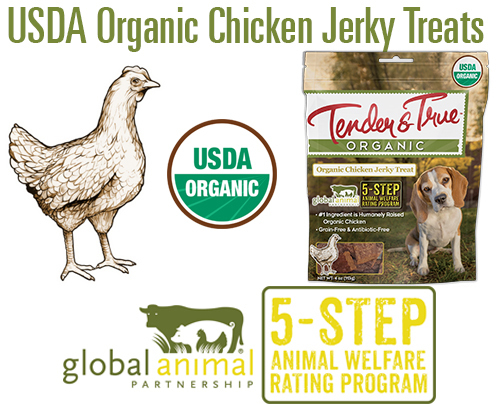 We guarantee that the organic chicken contained in each and every Tender & True Organic Chicken Jerky Treat pet product has been certified humanely raised by the Global Animal Partnership, a third-party nonprofit charitable organization, founded in 2008, that brings together farmers, scientists, ranchers, retailers, and animal advocates to improve the welfare of animals in agriculture. Organic Chicken, Organic Potato Flour, Organic Molasses, Organic Sugar, Non-GMO Coconut Glycerin, Organic Dried Cultured Skim Milk, Salt, Natural Smoke Flavor, Garlic Oil, Mixed Tocopherol (preservative). Like the organic poultry you have an opportunity to purchase from your butcher, we believe your dogs deserve to receive the same high-quality, organic chicken in their pet treats. That is why we created Tender & True Organic Premium Chicken Jerky Treats. All organic poultry are raised to our exact protocols with 100% organic vegetarian diets and are certified humanely raised by the Global Animal Partnership (GAP). We never use antibiotics or growth hormones. We start with organic chicken as the #1 ingredient. Our recipes are made with a precise blend of organic ingredients, antioxidants, vitamins and minerals expressly blended for optimal nutrition. No corn, wheat or soy is added to our recipes. Additionally, no artificial preservatives, colors or flavors are included in our premium pet treats. We start with U.S. raised USDA Organic Turkey as the #1 ingredient. All organic turkey used in our jerky treats are humanely raised without antibiotics to our exact protocols with organic vegetarian diets. Providing your pets with premium ingredients is our top priority at Tender & True Pet Nutrition. 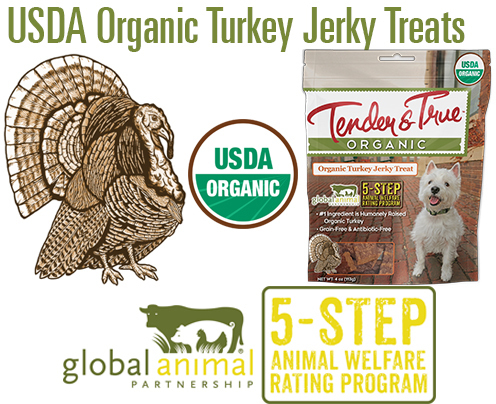 We guarantee that the organic turkey contained in each and every Tender & True Organic Turkey Jerky Treats has been certified humanely raised by the Global Animal Partnership, a third-party nonprofit charitable organization, founded in 2008, that brings together farmers, scientists, ranchers, retailers, and animal advocates to improve the welfare of animals in agriculture. Organic Turkey, Organic Potato Flour, Organic Molasses, Organic Sugar, Non-GMO Coconut Glycerin, Organic Dried Cultured Skim Milk, Salt, Natural Smoke Flavor, Garlic Oil, Mixed Tocopherol (preservative). Like the organic poultry you have an opportunity to purchase from your butcher, we believe your dogs deserve to receive the same high-quality, organic turkey in their pet treats. That is why we created Tender & True Organic Premium Turkey Jerky Treats. All organic poultry are raised to our exact protocols with 100% organic vegetarian diets and are certified humanely raised by the Global Animal Partnership (GAP). We never use antibiotics or growth hormones. We start with organic turkey as the #1 ingredient. Our recipes are made with a precise blend of organic ingredients, antioxidants, vitamins and minerals expressly blended for optimal nutrition. No corn, wheat or soy is added to our recipes. Additionally, no artificial preservatives, colors or flavors are included in our premium pet treats.